Got any plans for St. Patrick’s day? No? 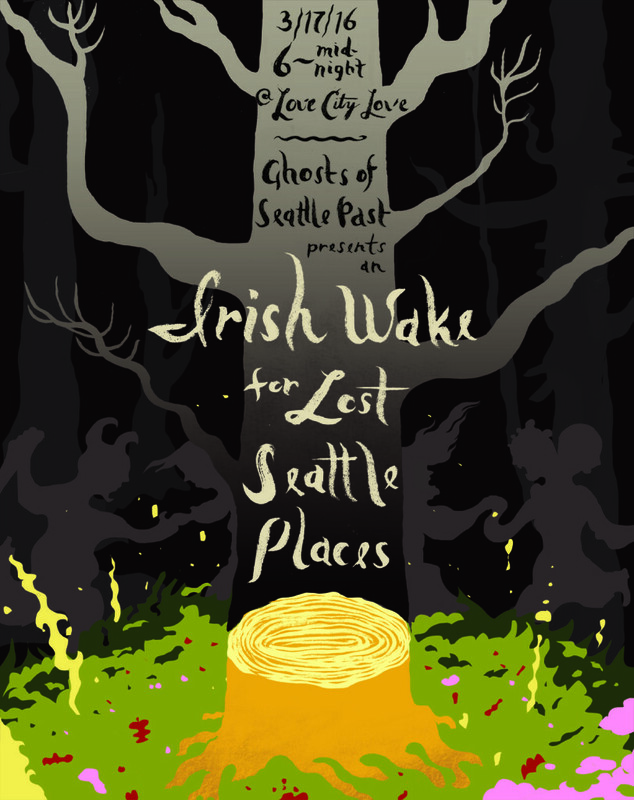 Well, how does a relentless, 6-hour Irish Wake for Seattle’s lost places sound? Join us at LoveCityLove’s new location on E Pike and 14th, from 6pm to midnight on March 17th for a jam-packed celebration, complete with 19 readings, 3 musical performances, short films, an art exhibit, and beer from Fremont Brewing Company! If you enjoyed our debut installation at Short Run Comix and Arts Festival last October, get ready for something bigger and better. Our anthology has been rapidly growing, and we can’t wait for you to see our next work-in-progress exhibit that will showcase everything we’ve been working on! 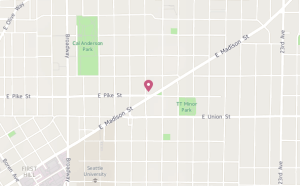 And, like last time, we invite you to add to our maps in person, submit your most missed lost places, and share memories of Seattle. The craic (an Irish phrase meaning fun, ultimate enjoyment, and entertainment) will really take off at 6:30pm when our performers raise their voices. Who are they, you ask? And Halfway Haus, a spectacular drag quartet comprised of Cookie Couture, Khloe5X, Betty Wetter, and Miss Americano. Even a chair from the old Velvet Elvis theater!! Want to hear the best part? This event is FREE and ALL-AGES! So bring your family and friends along to both celebrate and mourn the city’s fallen places with us! IT WILL BE EMOTIONAL! IT WILL BE UNCEASING! IT WILL BE A PARTY! Need directions? We got ’em! Come join us to publicly process all the change, and to do so as a group—in tandem with our neighbors, and as a community. Let’s hear about the places we have lost and commemorate their time in the sun. Step up to the mic and tell us where you miss. It will a party; it will be a Wake. Come celebrate and mourn our changing city. Next post: Open Call: Submit to Ghosts of Seattle Past!